I started a blog on sensor training. It is anecdotal but referenced. Mainly about usage in strength training but I hope to do more in cycling eventually. I read few posts, pretty good data collection and illustration, nice experiments. From post to post your message slightly changes and appears to me conflicting, but it might be subjective feeling from my side, not all NIRS are the same. I consistently used Moxy in 40km (short) TTs pacing, I’m sure it can be used for long events with even greater success. Moxy is great for timing and guiding max Criterium attack efforts, I could see after 15 of racing “today is not the attack day” it will be better to seat in, save the energy and burn all the matches in final sprint. Moxy can be really good in finding and extending your optimal final sprint. Moxy is great for guiding a good warmup, during warmup sessions in many cases I will be able to say: This will be great day. Great tool to see when you are ready to hit it again, in the race, but also during training when training around HIIT. In some of your posts you seem to be very close and you ask very good questions, but you seem to give up too quickly and turning focus to zones, lactate and constant referencing to training with power. I’m fairly new to Moxy, I used it for last 12 months, Moxy allowed me to increase my 60min power by quite a lot with less weekly training time. Last Oct I felt completely maxed out at my old FTP. I was told I would need to substantially increase training time in order to improve, which in my case was impossible. Today, with substantially higher FTP, I feel I didn’t even start hitting my full potential. I have changed the way I look at training, last year I was constantly tired, now I’m always fresh. Moxy is the only tool on the market (easily\inexpensively accessible to regular guys, there are other medical devices available) showing what is happening in your body during racing/training. What you are going to do with that info depends only on your imagination. Don’t give up, keep experimenting, less reference to current “power” based systems will speed up your progress. While I am glad people are "happy" with what they are getting from O2 sensor training, there still is a paucity of peer reviewed study on how to use it, and even if, this style of training has value. In fact, there is not a single published work on the use of O2 sensor data guidance and desirable outcome effects in both strength and endurance sports. My purpose in the blog was not to make any claims to the outcome effects but to have a "how to..." for a newcomer (particularly with weight training) and introduce some theoretical conjectures. My background is in science(medicine) and when we make recommendations it is with objective backing and literature review. My hope is for the companies making these products to back their claims with published studies, so all of us may benefit. While I agree about paucity of studies, which is always the case with cutting edge new emerging technology. I think companies making products should concentrate on innovating and making product better, smaller, cheaper, better battery life etc., and not telling people how to train. Let’s don’t forget Moxy is just a tool showing real time oxygen muscle saturation at the muscle level and to some extent at systemic level. How that info can be used for training is in the hands of a coach. There are multiple paths based on many factors. Moxy is not style of training, you still row, cycle, run etc, but now have direct feedback of what is happening in your body when you perform those activities. Until now I was always saying: I didn’t have the legs during last night FTP test…Now I do not even start one if I see during warmup I’m not 100% ready, if I do, I will fail. There is no other tool that could show me that before FTP test. Another analogy: Let’s take the best scalpel company in the world, they will not be teaching people how to do heart transplants… They simply provide great tool and it is up to the doctor to figure out the rest. I can only imagine first surgeries? No peer reviews at all, most of the time those pioneers were working against all the rules and under harsh criticism, breaking all the rules. Another comparison: is there any power meter company currently on the market that tells people how to use their power meter to train? There is none. What is worst, after over 20 years there is only one book by A. Coggan and A. Hunter around training with power, and all other books are just spinning the same concept, I have read them all. Concept of power is monetizing on beginner’s \ intermediate athletes where gains are mostly pronounced, pros do not use it that much as everyone is lead to believe. For average person none of the tools are really needed, increase the time and/or intensity and you will improve, problem is when you stop improving…, or when you have very limited amount of time and want to maximize training stimulus and avoid injury, or when you are injured and still want to provide stimulus. Your blog is very well organized and data is nicely collected and displayed, but I think you rushed with your personal “take away” about value of Moxy in cycling, I’m sure your blog could be great tool for many people, it sparks ideas etc. but I suspect once someone hit the conclusion they might be misled by your comments and discouraged in experimenting further, that’s how I felt, so your initial goal: engorgement turned in to opposite effect. Nothing personal just relaying how I felt after reading it. On the positive note, many of your data points were very similar to my findings, I just have very different interpretation of what I see in the data. Another comparison: is there any power meter company currently on the market that tells people how to use their power meter to train? There is an abundance of studies on using power to train, in fact it seems to be the main parameter measured to classify efforts. I really don't want to go back and forth about this. As I said, if you derive value that's great. Having been a physician in a very academic specialty for over 30 years, I come from a different perspective. You certainly wouldn't use some new therapy unless it was shown to actually work (and not just in yourself). In fact, I have been corresponding with one of the lead researchers in the NIRS field and he very much doubts there is any practical use for this in cycling (apart from basic science). My interest was more in guiding low load lifting for best risk/benefit in injury and aging populations. A potentially larger market than the cycling enthusiast. I think you missread my quote. "Another comparison: is there any power meter company currently on the market that tells people how to use their power meter to train?" None of the power meter manufactures released any training guides, if you are aware of one please provide the link. "There is an abundance of studies on using power to train, in fact it seems to be the main parameter measured to classify efforts." Agree: there is abundance of studies on using power meter to train, and again they are ALL around 1 book, and 7 power zones… it has very little to do with human physiology. Can you provide example that takes human physiology under consideration when training with power. Eg. zone adjustment based on current (today) fatigue? Training with power is all about measuring effort and not how that effort affected your system. Moxy on contrary can very quickly show you how last night training affected your body. I would absolutely use new therapy if there would be nothing to help me, and personally know many people that did use experimental therapy. In fact that is what drove me to Moxy, Power training was not giving me expected results. "My interest was more in guiding low load lifting for best risk/benefit in injury and aging populations. A potentially larger market than the cycling enthusiast." If you find Moxy useful in strength training, it is just matter of application to have same\similar benefits in cycling. If anyone is interested I posted some interesting observations in looking at costal (respiratory muscle) O2. I knew it will be just a matter of time before you will put pieces together. You have identified area that could use some additional work: inspiratory muscles. Now think about how cool would be to work on those relatively untrained inspiratory muscles, without doing 1min all out loads? Under Moxy supervision/monitoring it is possible and quite easy. You do not need to work hard to give them hard workout. The same applies to all other aspects of our body, you just have to learn how to interpret data and apply it. Our body is build out of many components, those are not equally strong\trained, at the same time no single biomarker exist that would allow you to detect red zone, what is red zone? Red zone of what part of body? There are many red zones in our body, some might show at very easy stage of exercise and will be quickly compensated by other members, and you might not even notice it, you might very easily miss it. Moxy will allow you on incredible precision in identifying quite a few components participating in cycling/running/skiing/hockey\any sport. In 2017 I used only Moxy on Deltoid to pace all my TT events and I was quite pleased with the results. After my 2017 season moxy was clearly showing need for upper body development (despite I’m cyclist) so I started rowing training on erg. Now I really see fight and evolution between untrained upper body and over trained lower body. I saw phenomenon where blood flows upwards to my untrained top despite the fact legs were doing majority of work (somebody could say impossible, but they would be wrong), now after my upper body became stronger I see “normal” “expected” completely opposite results. To my knowledge, there is still no peer reviewed publication showing that using muscle O2 data will make one a better endurance athlete or to be more useful at training guidance than power(watts). Some studies do show value in respiratory muscle training but some do not. In fact, some of the data show that the more elite riders get less benefit (possibly because intense interval cycling also improves the respiratory muscle chain). My conjecture is about avoiding a physiologically non sustainable power output by looking at the costal muscle O2. This would avoid the arguments about which leg muscle to look at, how deep is the area of interest, effects of rebound hyperemia, or even which leg to look at. I also do not necessarily feel that by looking at the degree of costal O2 drop we are uncovering some sort of limiter. Of course pulmonary function has a limit (as does everything), but again I am using this a better marker for decompensation not as a muscle to train somehow more effectively. 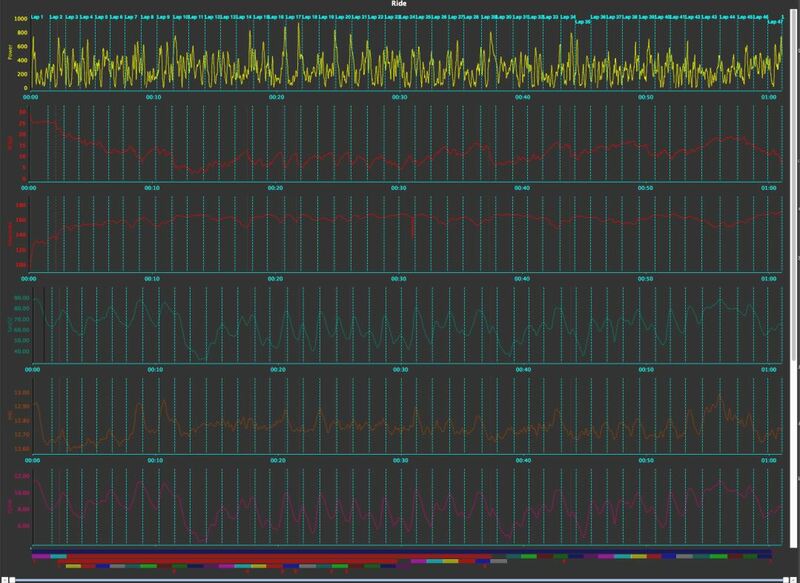 @sebo: you are probably on the bleeding edge of using NIRS for training / racing. It would be great to learn more about your practical experience on how you us it. lose interest after a while since it does take a lot of time and experimentation. If anyone wants to try "real time" costal O2 monitoring in a race/competitive situation, I posted some examples. Many thanks to XCSkier for help in understanding the sport, his data and advice. Thanks for the interesting article, just the 0% SmO2 is misleading I wish Roger would fix this. I can get 0% on my VL on a cycling ramp test too however I'm lucky that I can find a zone on my VL that gives me a greater SmO2 dynamic range and also dosent hit 0%. Having Moxy during TT, road race or Criterium helps a lot in: bridging, timing attacks, counter attacks, allows to set very precise pulls during breakaways, or power increase on uphills without bonking consequences, also it can nicely indicate when to take a sip of water or eat gel. In all hard efforts where we output a lot of power in short time and trying to avoid systemic overload and O2 deficit. Key word is systemic. Hence best place to attach moxy on is not engaged muscle, working muscle will not show much in those efforts, it will show you are working super hard, but are you already affecting your body at systemic level or not? In many situations your VL might show low SmO2 indicating hard work, but if you would check Moxy on eg Deltoid, it would show moderate SmO2 drop. Same rule applys to make sure you are recovered, VL smo2 will recover the moment you stop pedaling, but I can assure anyone I'm not recovered at that point for next attack, observing might be very misleading in those cases. I find Moxy very useful in racing, I use to ride with 2 Moxy sensors, now I'm riding only with one on Deltoid. Last night crit GC screenshot, check W' how closely it actually worked this time in relation to SmO2, which is not always the case. This was riding on the "edge" in single digit W' territory for almost entire crit, despite power being fairly low. My HR is not recovered from last big week of riding/racing. In last week race I got dropped from the break where W' was showing me a lot of room, by looking at SmO2 I knew my seconds are numbered. Moxy + HR + Power = best combo on the market.